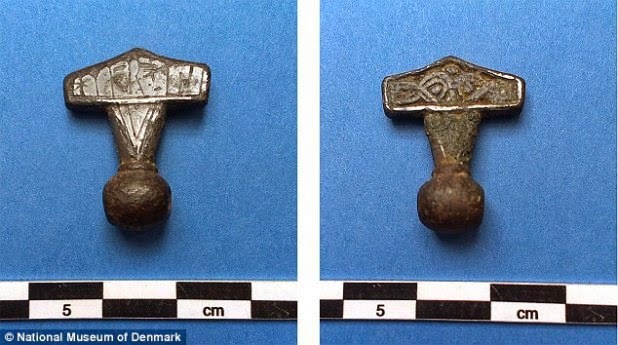 Someone has found Thor's hammer in Denmark. Yes, the fearsome weapon Mjölnir, capable of leveling mountains in a single stroke, the bane of many a Frost Giant and evildoer. It was a short-handled metal hammer, forged in Svartálfaheim by the dwarf brothers Sindri and Brokkr. They also at the same time made a few other special offers, including Odin's spear Gungnir, and Freyr's magic boat Ski∂bla∂nir and golden boar Gullinbursti. No, I don't know how you forge a pig. But then, I'm not a dwarf, which probably has something to do with my lack of expertise. Be that as it may, Thor's hammer was considered by the Norse gods to be the best of the gifts that the dwarves ever made, because not only did it smash anything you like to rubble (its name means "the pulverizer" in Old Norse), it returned to Thor's hand when it was thrown, which is pretty convenient. Of course, the problem is that it, like the spears and boats and golden pigs and (in fact) the Norse gods themselves, are mythological. I.e., not real. This is a point that seems to have escaped a lot of people, most notably Giorgio Tsoukalos (he of the amazing hair), who thinks that they were aliens. The Norse people couldn't just have made them up, he says. No way could people dream up valiant warriors and magical powers and epic battles between good and evil without it having some basis in the visitation of Earth by extraterrestrials. Which therefore also presumably explains how Tolkien came up with Lord of the Rings. 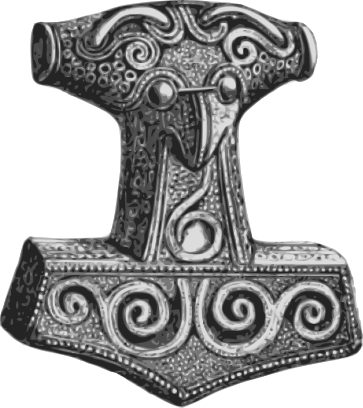 So, according to the story over at Ancient Code that I linked above, we now have concrete proof that Thor existed, because they've discovered his hammer at an archaeological dig on the island of Lolland, in Denmark. The hammer bears an inscription that says, "Hmar is" ("This is a hammer"), in case we weren't sure. Thor's Hammer is some kind of ancient alien weapon that allowed him to reign throughout the lands and protect his people? Furthermore, it was said that Thor's Hammer was made by two dwarfs. This really interested us because Ancient Alien theorist [sic] do believe in various alien races, which could lead us to believe that these dwarfs could have been Grey Aliens, commonly depicted as standing 3-4 feet in height and having an advance knowledge in technology which could be mistaken as magic to those who are unaware of the power behind the laws of the Universe. In addition, it seemed that the Hammer was made to be used with the aid of two "iron" gloves, perhaps giving some kind of a magnetic signal to the Hammer, so when thrown, the Hammer would return to Thor. Looking deep into the depictions of the use of this weapon, it really seems more like a modern day weapon, something conceivable to us today, but magical to those in the past. So that sounds pretty amazing, and you can certainly see why this discovery has induced the Norse-gods-are-aliens aficionados to leap about making happy little squeaking noises. ... is only about five centimeters across. For those of you who don't think well in metric, that's a little under two inches. With a hammer that size, Thor would have been able to fell mice, and possibly a bunny, but not much more than that. The Frost Giants, on the other hand, wouldn't have had much to worry about. So the archeological find is probably just a piece of Norse jewelry, and all of the hype a bit anticlimactic. Not that this will stop Giorgio Tsoukalos et al. As we've seen over and over, it doesn't take much to get him excited. 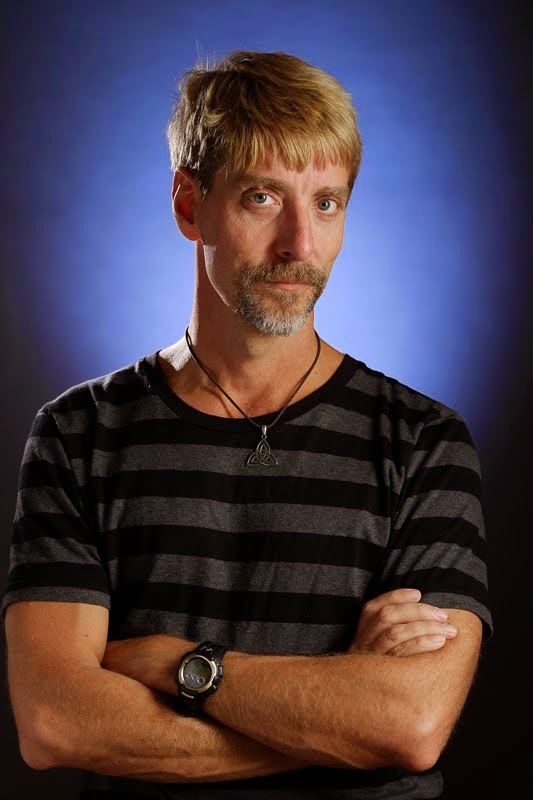 Expect an episode on this amazing find on the This Really Isn't History Channel soon. You don't need magnetic gloves to make the hammer return. Obviously you just have to tune the thing to Thor's vibration resonance quantums, and it'll fly right back every time. Which is a little inconvenient when, say, the mighty god is in the bath with his favorite Valkyrie, but whatever. It's magic. I don't know what Marvel is trying to prove, but their explanation that everything a Asgards alien technology seems like a lot of horseshit to me.